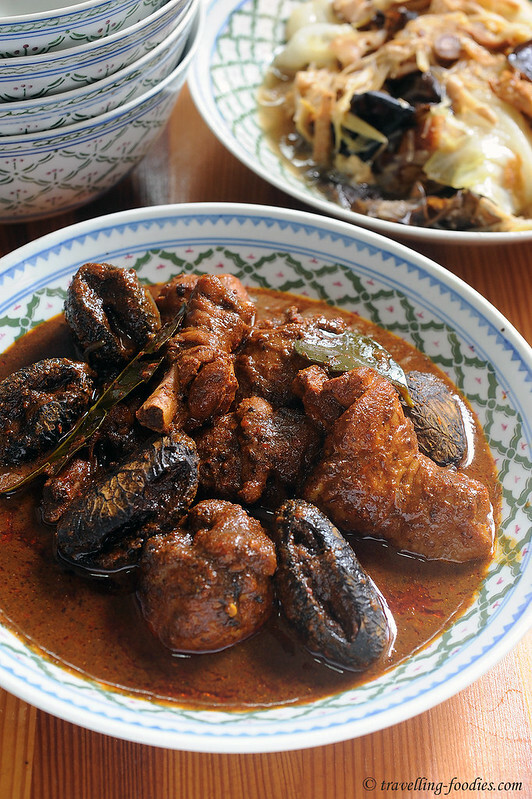 Ayam Buak Keluak… such a love-and-hate relationship with this classic Peranakan dish. As much as I love eating it, I loathe making it. The preparation work that precedes is so much more laborious than the actual cooking of the dish itself! So so much more laborious! Work starts days ahead with the soaking and daily scrubs of the black nuts imported from Indonesia. While most recipes call for prep work three days in advance, I make it a point to soak for a minimum of five days, sometimes up to seven! And to make things “worse”, I do water changes and scrub not once but twice, literally day and night, making sure that they are good to use and safe for consumption. Not taking any chances here. Perhaps it has come to a point of being obsessive. What to do?! Most Peranakan restaurants charge them by the nut nowadays, how else can one enjoy the unique flavours of this dish without having to empty my pockets. Yet to enjoy this dish periodically is a dire need and not a mere want! Now you know why I love it to bits but hate it to the core at the same time! I attended Chef Malcolm Lee’s Ayam Buah Keluak Demonstration Workshop held in conjunction of ToTT’s 2nd anniversary celebration last year. A graduate from At-Sunrice GlobalChef Academy, Chef Malcolm did not just pick up the ropes of culinary arts at the cooking school, but started young at home. Coming from a Straits Chinese family, he was exposed to traditional nyonya dishes since young, often given a “warm welcome” as he came home from school to a delicious lunch spread being laid out for him, being able to pick up wafts of wonderful aroma from the food even before he stepped into the house. Homemade dishes at their best, as little seeds of passion for Peranakan cooking which germinated and grown in the years to come. I found the class to be rather helpful, shedding new light to old ways of preparing Ayam Buah Keluak which I thought I already knew. Naturally I was wrong. Peranakan cooking is so rich and complex in culinary techniques, owing much to the amalgamation of so many different cultural backgrounds of the various races and ethnicities that helped carved and shaped the history and heritage of this unique community. So there is much more to be learnt. And it didn’t help with many traditonal recipes being fiercely guarded by the true doyens of Peranakan cooking, bibiks and nyonyas of the yesteryears who carried many of these “secrets” to their graves. Like etching patina off a piece of antique Straits Chinese red and gold furniture to reveal the lustrous gilding beneath, the opportunity to learn from another Peranakan is an opportunity to get to know more about the practices of the past, some of which are unique to one’s own family. While many of these signature dishes from Peranakan cuisine are immensely popular and well-known, few of them are ever cooked the same way. 1. 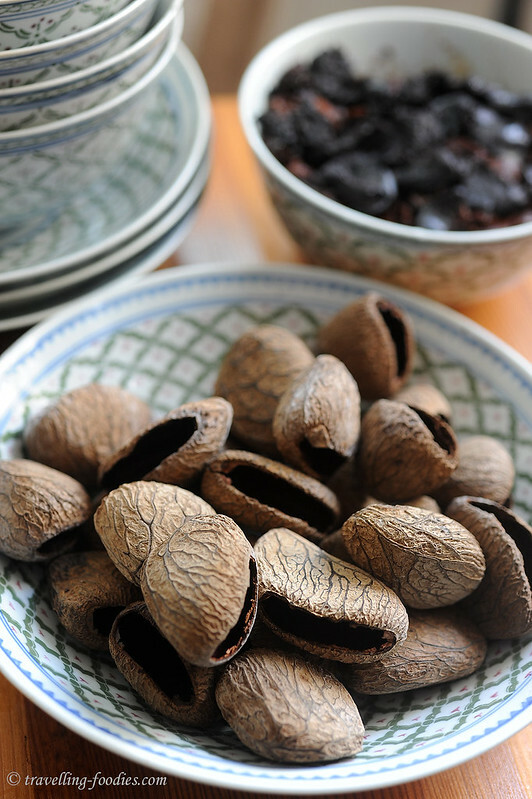 To prepare the black nut, soak for at least 3 days, scrubbing and changing the water every day. On the day of preparation, crack open nut with a small chisel hammer or pestle of a batu lesung at the “lip” where the nut is smooth. Remove the kernel of the nut and grind through a fine sieve to get a firm smooth paste. Reserve 150g of the black nut paste for the gravy. 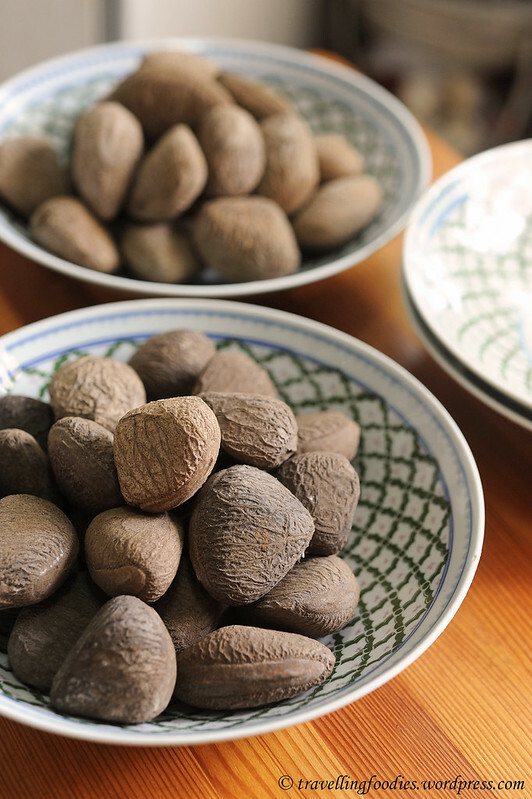 Season with the remaining paste with a pinch of salt and pepper, and proceed to stuff the rest of the black nut paste into the nut shells, using the back of a dessert spoon to firmly press the paste against the interior of the shells. This helps to prevent them from dislodging during cooking. 2. 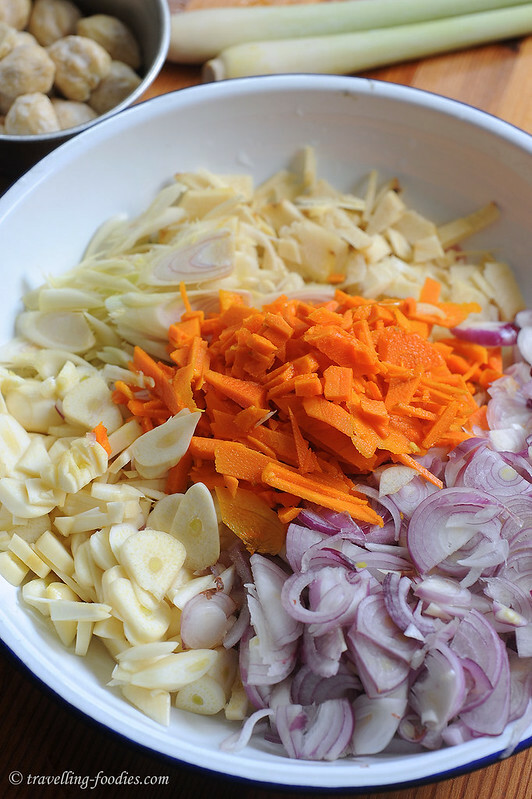 To prepare rempah, blend chopped garlic and shallots first together with belachan. Strain the mashed garlic and shallots over wire sieve to collect juices. Use the juices to blend buah keras, kunyit, lengkwas, serai. Add some water if necessary. 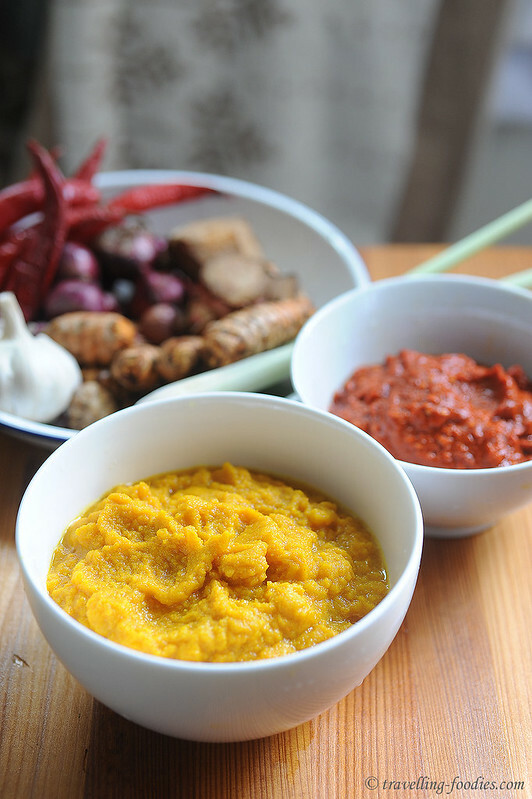 Blend reconstituted dried red chilli separately to make cili boh. Combine all the components together for a final blend till a smooth consistency. 3. To fry the rempah, first heat wok and dry fry rempah without adding any oil. This is to allow the excess moisture and water introduced during blending to evaporate. After the rempah is reasonably dry, add oil and stir fry over medium-low heat until fragrant. 4. Add in the reserved black nut paste and tamarind water simmer for 10 min. Add kaffir lime leaves at this point. For more oomph, crush with a pestle or back of knife the upper parts of the serai and add into the gravy. 5. Add in chicken, stuffed black nuts and enough water or chicken stock to cover and braise till meat is tender. Season with salt and sugar. 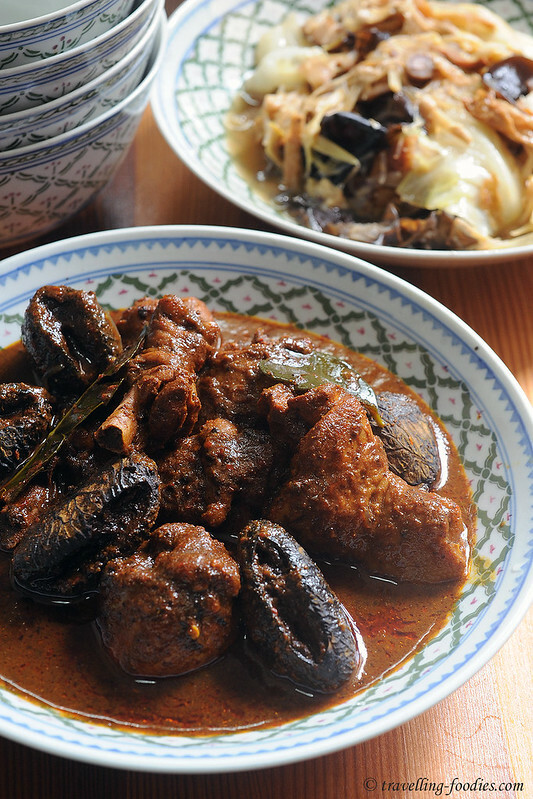 Unlike the version I cook which has a more “kuah pedas” look from the red gravy, Chef Malcolm’s recipe produced a much darker base owing to the buah keluak paste being added. But do not be deceived by its looks. It is actually more pedas than my earlier recipe. But every Peranakan household has its own recipe, so do adjust it to your own personal liking and family preference by changing the amount of pulp and cili boh added to the gravy. To stuff the nuts with minced pork, shrimp or fish or not, it is entirely up to the individual. Some family recipes call for it, some prefer a more “nutsy gutsy” experience and do a “all nut paste” version. I’d learnt the innovative way of ridding the rempah of excess water from Chef Malcolm, i.e. to dry fry it to evaporate the water used to blend the ingredients earlier. Traditionally, my mum and grandma just “heck care” and added to the oil, suffering quite a far bit of burns from the oil that splitter splatter from time to time. I was most unfortunate to “kena” some too for standing too near. Now I know! The grinding order introduced by Chef Malcolm was also new to me. 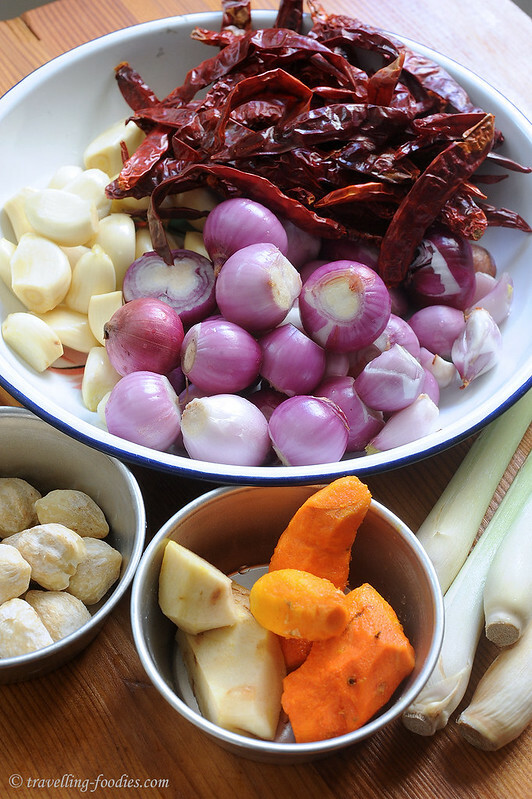 Typically for batu lesung, we start with the hardest ingredient like buah keras and serai and slowly work through the gingers, the shallots and garlic and finally the chilli. I thought the use of sieved juices from shallots and garlic was rather clever to minimise the addition of water subsequently. I changed the order slightly by adding belachan to the garlic and shallots instead. The salt from the shrimp paste would kickstart exosmosis from the shallots and garlic, causing them to release more juices, making the grinding of the subsequent hard and fibrous fellas like serai, kunyit and lengkwas much much easier. So that’s a little science involved! I am submitting this dish to Aspiring Bakers #28: Chicken Feast (February 2013) hosted by SSB of Small Small Baker. This entry was posted on February 27, 2013 by Alan (travellingfoodies). It was filed under Food, Simple Eats and was tagged with ayam buah keluak, belachan, chicken, cili boh, indonesian black nut, Nonya, Nyonya, Peranakan, rempah, straits chinese, tamarind, 土生华人, 娘惹. Wow Alan! Just like what you said right in the beginning – so much preparation work?! I think I’ll give up making this at home… To fix my craving, I would either go to a good Nonya restaurant or get myself invited to your place… LOL! Thanks for your participation to my CNY Delights event. I tried this Ayam Buah Keluak during our last visit to Melaka, frankly, we were seem could not really accept the taste. Anyway, your Ayam Buah Keluak look real authentic. Hi! I recently found your food blog and I am amazed with all the recipes you’ve provided! I too come from a Peranakan family, and was checking out Ayam Buah Keluak recipes online which led me to your blog. My late grandmother uses the exact same ingredients for the rempah except that she doesn’t blend/pound the seray (lemongrass) as part of the rempah. Instead, she’ll smash and drop a few stalks to fry with the spice paste. She taught this “method” to my mother, whom I inherited this same recipe. I would like to ask you about the difference (whether in terms of flavours etc.) if one were to blend the seray together with the rempah as compared to my grandmother’s method. Thank you very much.